5:23 Dan does not come from a golfing family. 5:38 First involvement was in WA at Stuart Hill golf course built in bushland by Mr Hardy and Mr Douglas. Dan used to go with his brother to a fig tree on the course and steal figs. They were caught and as a punishment had to weed some of the golf course – this turned into caddying for Mr Hardy and Mr Douglas at weekends. Dan spent all his free time playing golf. Putting at Stuart Hill Golf Course was against an ordinary house brick until a Welshman named Eric Albert redesigned the course. 9:27 Joined Air Force for WW2 service at 28years at Woolloomooloo, Sydney NSW and found the arithmetic and algebra academically challenging but he persevered with his training and is extremely proud of getting through. 11:30 Dan was 13 yo and his brother, James was 11yo when they stole figs. 12:16 Won WA Open Championship in 1937 and 1938 at ages 22 and 23years. Became Nedlands Golf Pro, his first professional job. He followed his girlfriend Edith (still married to Edith) to Sydney in about 1940/1941. 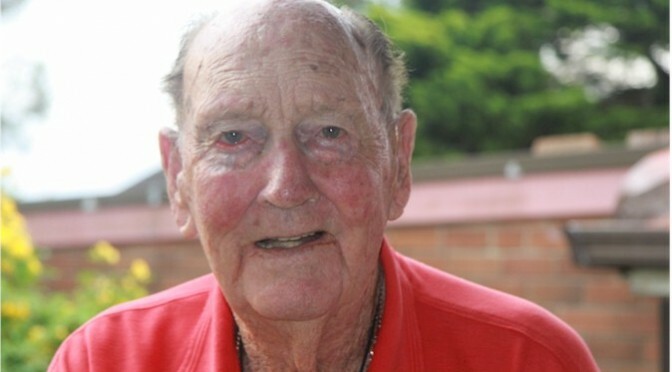 Bobby Locke had advised him to go to Sydney to develop his game/enhance his golfing career. 14:08 During WW2 he played golf on leave at many courses including St Andrews in Scotland. Was an Officer and a Bomber Pilot. 14:57 After WW2 applied for and got the Pro position at Roseville Golf Course and accepted the position despite not being allowed into the clubhouse. In the first week he played a game with Arthur Shoebridge (Road Commissioner), Gus Grayson and 2 other influential men who overturned the rule that Club Pros could not go into the clubhouse. At Roseville from 1946-1953. 16:53 Very happy at Roseville. 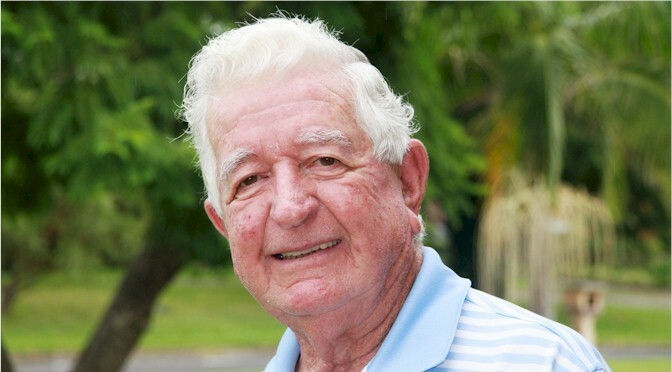 He secured the PGA to get played at Roseville – a coup / was assisted by Arthur Shoebridge. At this stage of his life Dan found that drink was a balm and a help for post war stress. No awareness of post war trauma or support offered to war veterans and he went downhill with drink while at Roseville. Leaving Roseville was mutually agreeable. 18:46 Went to St Michaels as Golf Pro. Excellent golf Club and probably the best professional job for a Pro in Australia at the time. Was there for 23-24 years. Dan decided to build a golf range alongside the course. Sold the range in 2012 to St Michaels Club – was a good earner. 19:53 Typical week at St Michaels. Monday – Catholic Clergy day, Tuesday – Ladies Day, Wednesday – ordinary day, ‘marker boys’ – a good crowd, Thursday – Competition Day, Friday – business men, lots of players. Sat and Sun – very busy. 22:43 Taught on the 1st, 8th or 18th Fairway – risks of being hit so he started the driving range and taught there. Aboriginal boys used to wait in the bush and steal the golf balls so he carried a shotgun with him and fired it into the air to scare them away. Used to teach with the shotgun by his side. Made some handmade equipment and did repairs but manufactured clubs were much better. Used to buy ‘rough heads’ made of American persimmon – a head in a reasonable shape and used a rasp, file, another file then sandpaper to get a good head. Tools used were generic and not specific to golf. 28:05 Playing career – loved the game, practised consistently. After winning the WA Championship twice he lived in Hurstville, NSW with Edith’s family but could not afford to play for 2 years and had no money to take up an offer to go to America. Very hard to be a Golf Pro and a playing professional. One of the paper boys suggested he play in the British Seniors; he played against Bobby Locke and came third. He went twice. He played in America twice for the Seniors and won money both times. Didn’t really take all the opportunities that were available to him. Went to the Far East Circuit with George Mansfield. 34:21 Golf Pro in clubs role over the years. In Cottesloe in Perth he was treated very well as a boy but when he had to stay and sleep in the club he was given left over plate scraps reheated by the caterers for his meals. At Nedlands he was part of the ‘deal’. In Sydney, Mr Bourke at St Michaels and Lance McGowan were excellent – no letter writing, decisions were made verbally and promptly – no ‘bull dust’. Excellently run golf club. 39:04 Changes in conditions for professional golfers – Boards had significant powers. 32:09 Dan was chairman of the PGA and had a lot of contact with touring professionals – met them all – no disharmony between touring professionals and himself. Of latter years, Dan was aware there was discussion with some overseas players. Head of PGA for 3 years. 42:50 Changes with clubs – hickory clubs – some broken every Saturday which usually had to be repaired overnight. Hickory could snap if it hit a bush. Drivers didn’t break as much. Less than 17/18 yo when steel shafts introduced. At the start repairers found it hard to fit the shafts, even the boss didn’t know what to do. 46:40 Balls got better and better gradually. Top balls were Dunlop, Volley and balls from North British Rubber Company. 1934 costs were about 2 shillings; second grade was about 1/6d. 42:47 Bags got bigger and bigger but in about 1986 players were allowed just 14 clubs. Dan talks about caddie duties when he was an assistant. 50:10 Golf buggies – first one he ever saw was at Roseville after the war (WW2). Arthur Shoebridge – President of the club was the first he knew to own one. They became very popular. 51:00 Asked Dan about role of caddies and Dan replied that he doesn’t really know. 51:50 Golf clothing – as a young golfer Dan played in Plus Fours – ideal garment for golf in his opinion. 52:56 Golf Course design has changed in that they are becoming more and more difficult with more hazards, more undulating greens – playing the ball out of a bunker is too hard. The game of golf is not as much fun as it was in the past. 55:14 Consistent grass and better grass today. Couch fairways are best for our climate. Kikuyu not as good. 56:40 Greenkeepers more knowledgeable now with better fairway mowers. 57:15 Golf has been influenced by tournament players. 57:46 Comments on PGA as a professional body and Golf Australia. 59:00 Dan still teaches about 6 students at 98 years. For the last couple of years it has been getting more and more difficult as he can barely walk. Watches golf on TV. Philosophy on teaching – a golfer needs 3 qualifications: a pair of feet to stand on, a pair of hands to swing the club with and no brains. The golf swing has not changed much at all over the years in Dan’s opinion. Dan believes golf training has become too complicated. He taught everyday people. Bob Stanton was his most outstanding pupil (BS beat Arnold Palmer when he was about 18yo). Teaching gave Dan great satisfaction. 1:05:03 Golf is spoken of as a funny game because it is unpredictable. Referred to Tiger Woods and his hard work and practice. 1:07:05 Son and daughter both excellent competition standard players. 1:07:53 Speaks of his 5 brothers – all outstanding sportsmen. 3:55 – 6:29 Tom Moore’s summary of his life in golf – as a Golf Professional and as a player. 6:30 – Life as a 12 year old caddie in 1943+, golfers he caddied for were leaders in the community, very respectful men, golf balls in WW2, great spirit showed by the players. Rules of golf very fairly applied and this taught him life-long values. Jimmy Banks – creator of Ginger Meggs’ cartoonDan Dwyer – second in charge to General Blamey and the Head of the Johnson and Johnson pharmaceutical company. 8:45 Tom’s training as an accountant at Business College after leaving High School and early work in Accountancy at The Australian Glass Manufacturers factory at Waterloo, started at 15 years. Left in 1950 at 19yo. 9:50 Professional golf career began as an amateur at Asquith Golf Club started at 16 in 1947. Difference between amateurs and professionals / Golf professionals ‘glorified caddies’. Caddies were called by their surname. The amateur was ‘king’. No touring professionals. Amateur games written up by the newspapers /professionals had little publicity. 1930s Norman Von Nida – changes occurred for professionals because of him and because of Exhibition matches of overseas professionals. 12:50 Muirfield Golf Club appointment as golf professional. When Tom started the club was bankrupt. Golf at the time was a ‘winter’ game. Golf started in the first week in March each year and stopped last week of November. Golf became a year round sport because of the advent of television in 1956. 15:59 The role of a golf club professional in 1950s and 1960s – received a small stipend, free rent on golf shop. Teaching, Committee influence, shop open 7 days. Christmas Day only day closed. 18:02 Learning the art of making golf clubs and golf club assembly. Use of persimmon wood. Danger of persimmon wood running out. Laminating, plastic woods, aluminium alloys, titanium. No Australian woods suitable. Stopped working with persimmon in the 1970s. At Muirfield Golf Club for 23 and a half years, left at age 46 years. 20:47 Events played in Australia and overseas. Not possible to be a player and a golf touring professional. 21:28 American influences. USA active in promoting tournament golf/USA tax breaks/ use of charities to raise money for golf. 22:12 Moved to Auburn Golf Club – much better work and salary conditions for golf professionals. Role of golf professional much the same in the 70s and 80s. Professional business attitudes in the running of the club. Review of reasons for leaving Muirfield. Equipment now mainly made in factories. 25:46 Very few golf professionals like Tom had careers other than golf based like Tom’s accountancy qualifications because he had a gap between leaving school and starting work as a Golf Professional. Tom’s training in Accountancy helped him in his work. Golf professionals who were not passionate did not keep their jobs. Some golf professionals could not play golf well but they were in the minority and clubs got rid of them. 28:44 Caddie work in the clubs finished after the war. 29:37 Photographic science changed training approaches. Golf balls improved. 30:26 Instruction manuals, books, magazines – Tom had to read them all. Cigarette cards very popular in the 1930s. Tom did not use film to analyse his trainees. 32:09 Golf gizmos and gadgets – Tom a traditional trainer. The sort of people he trained. He trained touring professionals such as Jack Newton. Betty Cuthbert, Jack Newton. 34:00 In the 1970s – setting up golf contracts / minimum standards of pay – new initiative. Setting up of a Provident Fund. 35:56 Interaction between touring and club professionals. Two separate camps – Club Professionals qualifying School. Tournament professionals. Touring professionals ‘looked down’ on Club Professionals even though club professionals were often excellent players. Now can be a member of both ‘camps’. 38:05 Hickory shafts/Steel shafts/ USA influences on changeover from hickory to steel. UK followed suit. Buying set of golf clubs. (1930s). There were some matched sets of hickory golf clubs. 45:21 Graphite shafts / lightweight steel – manufacturers now make almost all clubs, no longer a role for Club Professionals. Names, numbers of golf clubs. 47:30 Golf bags / Golf Buggies – changes over the years up to the 1970s – significant changes. Advent of wheeled buggies for bags. 48:47 Tees pre-war/ up to 1939 – made out of sand with an egg-cup shaped container filled from sand buckets. Caddies built the sand tees and knew the type of tee the golfer they caddied for wanted – no such thing as the tee used today – this came in in the 1930s. 52:08 Original golf clothing – Plus Fours / reasons for Plus Fours. Golf clothing today, men and women. 53:17 Females in golf – up until WW2 females were tolerated but had different conditions imposed upon them in golf clubs. 54:19 Golf course design – golf ‘along the ground’/ Arial golf. Modern golf is different because of golf course design especially with the introduction of water features. 55:25 Grass – early courses tried to copy Scotland – didn’t work in Australia because of climate apart from the golf courses in Melbourne which has an excellent climate for golf grass and has the best courses in Australia. 56:25 Green keepers then and now. Were glorified labourers in the past. 57:13 Major influences on Australian golf – UK or USA. American influences predominant on Australian golfing despite our historical links to Scotland. USA has the population to produce the champions. 58:08 PGA – then and now. 59:18 PGA as compared to Golf Australia. Was a lot of disharmony in the past, now a lot more cooperation. 1:00:28 Golf since retiring – very active in all aspects. 1:01:27 Attendance at tournaments – promoting the work of the AGHS and the history of golf. 1:02:08 Why is golf a funny game? Funny peculiar not funny ha ha. 1:05:03 Additional comments / lovely life in golf/ wonderful wife/ Boy Scout/ bush walking/ politics. Tom’s children/ grandchildren – all can play golf but they choose not to play golf – Tom never pushed golf onto his children or grandchildren as he witnessed the damage pushy parents can do.